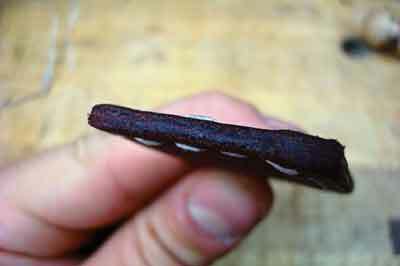 As a woodworker, having basic leather working skills can be very beneficial. Leather is the ideal medium for protecting our sharp edge tools both in storage and in transport. Let's face it, those cheap synthetic accessories on the market today can't compete with their leather counterparts. I'm frugal by nature: if I don't have to buy a tool, I won't. 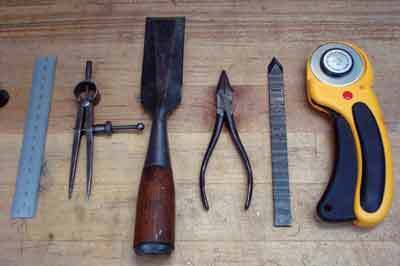 Working leather requires a few speciality tools, the rest can be covered with standard woodworking and household tools. 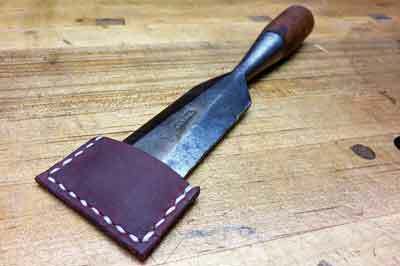 In this article, I will illustrate leather working tools and techniques necessary to make a protective cover for a 37mm wide Stanley chisel. All of the procedures today can be applied to most any chisel size or type. 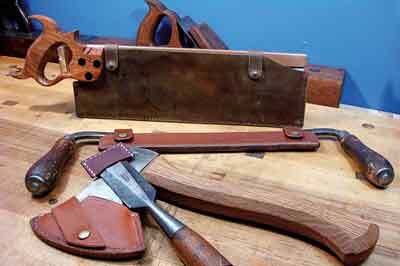 You can also apply them to holsters and sheaths for other tools - be creative. 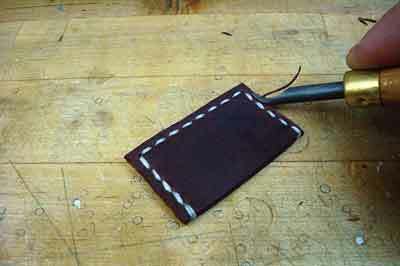 This project will focus mainly on hand stitching, as that is the cornerstone of leather joinery. I'll show how a minimal investment in tools and supplies can help protect all of the sharp edges you work so tirelessly to achieve. When selecting leather, only choose vegetable tanned leather as it's less likely to corrode your tools. You can purchase remnant bags of veg tan from your leather shop; there's no need to purchase an entire hide. As always, proper tool maintenance is a must. Waxing your tools or wiping them down with oil after each use is the best way to prevent corrosion, regardless of leather type. Leather is available in a variety of thicknesses. Choose the thickness based on the tool you intend to cover. Heavy-duty items, such as axes or drawknives, should be protected with thick, durable leather. 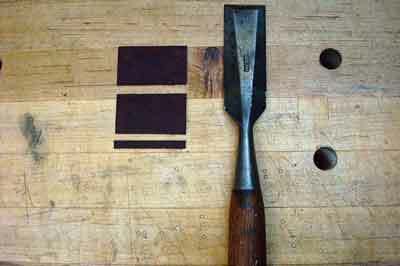 More delicate tools, such as fine backsaws and chisels, should utilise lighter leather. Since those tools should always be handled with care, a bulky sheath just isn't necessary and can be cumbersome to work with. A basic tool cover consists of three pieces: the two main outer covers and the welting. 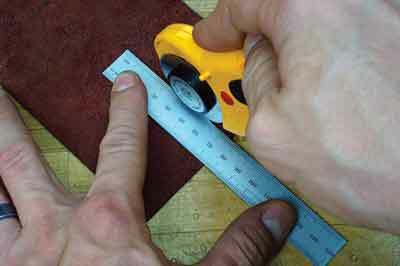 Using a rotary cutter and a metal rule as a straightedge, cut the leather approximately 10mm oversize in all dimensions. You will need two pieces that are the same size for the outer sections. The third piece will be a strip 5mm wide; this is the welting - it is sewn in between the other two layers at the end of the chisel cover, preventing the sharp blade from contacting the stitches. Welting is a must, there are no two ways about it. 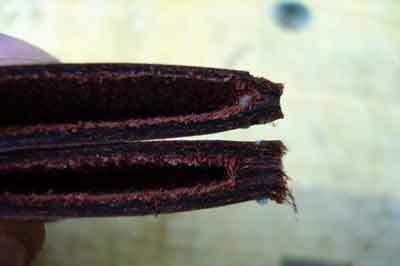 To prevent a bulky transition at the ends of the welting, the ends need to be skived. 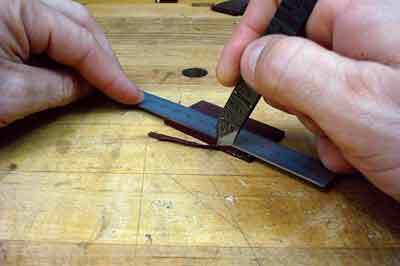 Skiving is the act of reducing the thickness of the leather. There are specially-made tools for this purpose, but all you need is a sharp chisel and a steady hand. Gently taper the last 5-10mm of each end of the welting using the back of the chisel. You are now ready for glue up. 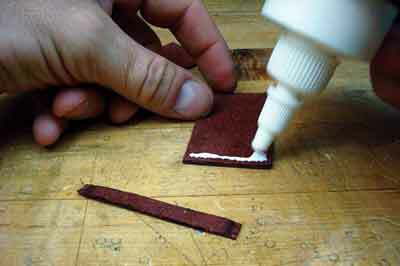 Apply a thin layer of leather cement to the seams that will be stitched. Line everything up by hand and clamp the pieces together with binder clips. Once the cement cures, use a straightedge and marking knife to flush the edges up. 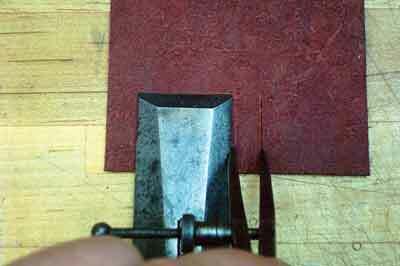 The stitching groover is now used to cut a groove along the stitch line. Using a diamond chisel, punch holes along the stitching groove, starting in the corners to ensure proper spacing. 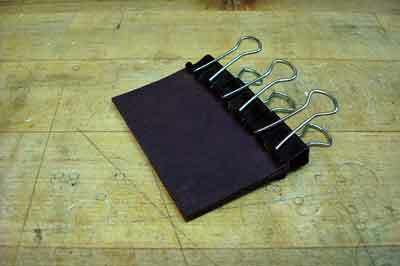 If you research hand stitching leather, you will no doubt come across references to a stitching pony. The stitching pony is a wooden clamp with leather-lined jaws that holds the work, freeing up both hands for quick and efficient stitching. 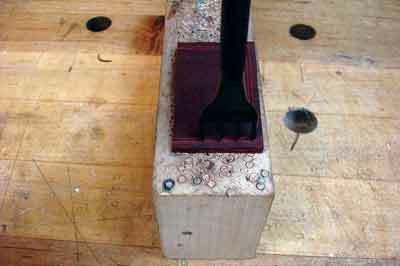 Stitching ponies excel at holding work when longer runs of stitches are needed. When making smaller items, I just hold the work in my hands. For me, it is easier to manipulate the needle and the workpiece as I stitch. This is where the needle nose pliers come in handy. You can insert the needle in a hole and pull most of it through by hand. 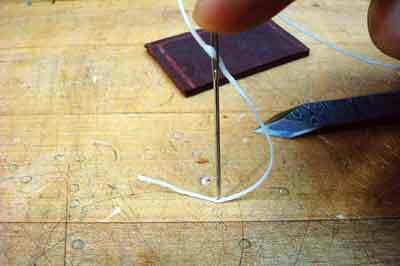 Once the eye of the needle reaches the hole, use the pliers to pull the needle the rest of the way through. Over time, those pliers will become your best friends. They save your fingers from the abuse that waxed cord can dish out, and let's be honest, a stitching pony takes up space - space I'm not willing to give up for an appliance that will be used sparingly. Needle nose pliers take up much less room and are far more versatile beyond leatherwork. It might be unconventional, but it works and gives great results. Now it's time for the first stitch using a saddle stitch. It is an extremely strong and long lasting stitch that is impossible to accomplish by machine - it can only be performed by hand. What follows is an abbreviated lesson on saddle stitching. 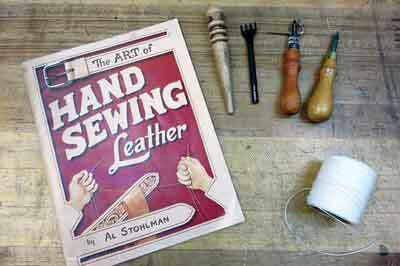 For more information, The Art of Hand Sewing Leather by Al Stohlman is considered by many to be the authoritative tome on stitching leather. Start the stitch in one of the holes at the opening. 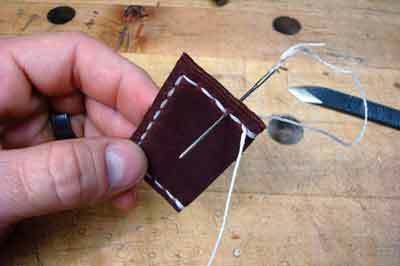 Insert one of the needles and pull the thread through until you have equal amounts on both sides of the leather. 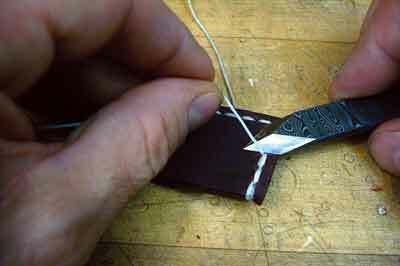 Instead of going straight to the next hole, loop the needle around the opening edge of the leather, going through the first hole again from the other side. 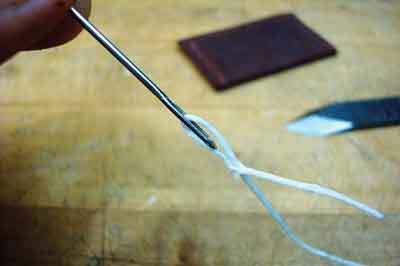 Do the same with the other needle, completing the first stitch. I prefer to start and end my stitch this way if possible. It locks down both pieces of leather and helps reinforce the opening. Continue your stitch by inserting one of the needles through the second hole, using the needle nose pliers to assist when needed. 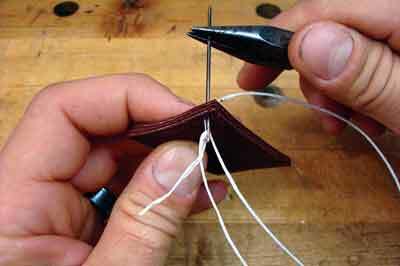 Traditional hand stitching calls for thick pads on the palms to help push the needles through. 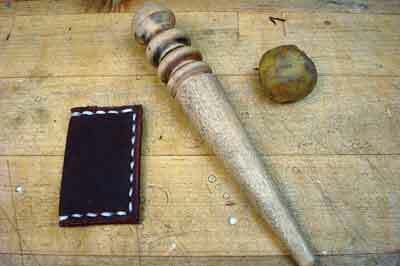 It also calls for holding a sharp awl while stitching, used for opening the holes for the needles. Using the pliers eliminates the need for both tools. As you continue your stitching, know that consistency is key. I always start each stitch with the needle on the right, inserting into the hole, pulling through the excess thread. I then insert the other needle in the same hole, on top of the other thread. 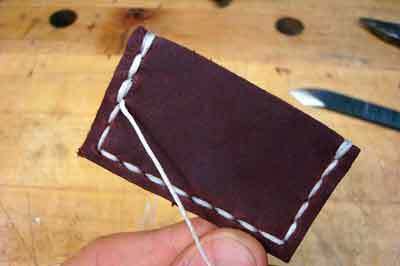 Pull the thread through, then grasp both threads and give them a snug pull. Starting again with the right needle, I continue this process until I reach the last hole. I wrap both threads around this side the same as I did on the other opening, going back into the first hole with both needles. I complete the stitch by stitching back two holes, locking the threads in place. 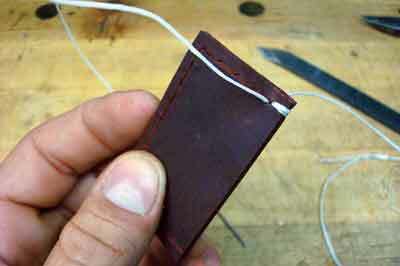 Using your marking knife or utility knife, cut the threads off as close to the leather as you can. The waxed thread and the backstitch are more than enough to secure the stitch. To finish it all off, the edges need to be bevelled and burnished. This step isn't necessary, but it's the sign of quality work. 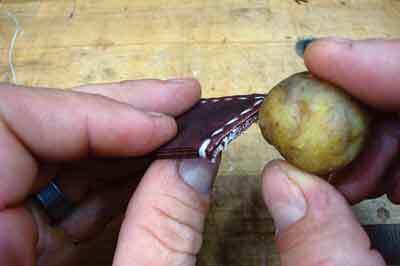 Use the edge bevelling tool and round off all of the edges of the chisel cover. 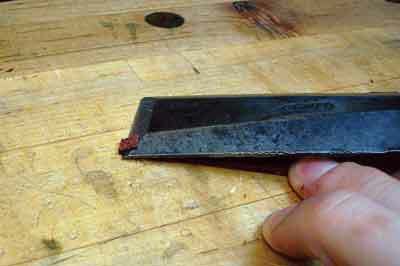 Gently rub the edges of the chisel cover with wax - either beeswax or paraffin wax will work fine. 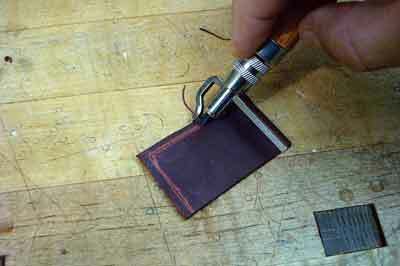 Using the burnishing tool, rub the wax into the edge of the leather until a smooth surface is the result. This step not only improves the overall feel and aesthetic of the piece, it also seals the end grain of the leather, preventing moisture ingress and extending the life of the leather. Occasionally, the leather cover could use a light coat of neatsfoot oil or mink oil. Either one will do a splendid job of keeping the leather in top form. Now, take a slow look around your workshop. With your new found skill set, nothing is safe. Soon everything will have a custom leather cover! 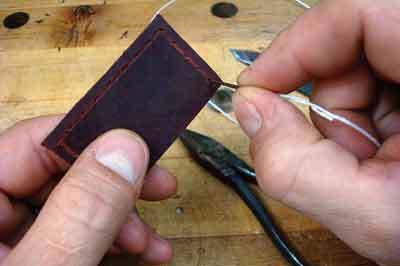 There are several different techniques outlined for threading a needle for leather work. The technique shown here works best for me. Begin by selecting a length of thread appropriate for the amount of stitch work needed, generally 3-4 times the total length of the required stitch. Insert one end of the thread through the eye of the needle. 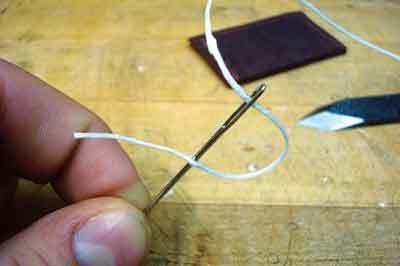 Pull a bit of thread through the eye so that the tip of the needle can reach about 30mm from the end of the thread. 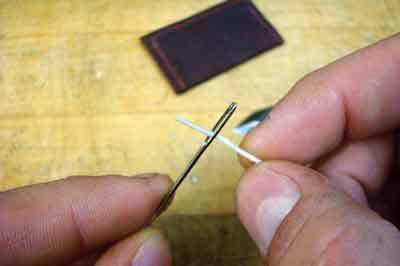 Pierce the thread with the end of the needle, sliding the pierced thread down the shaft towards the eye. 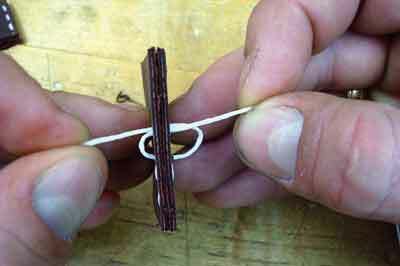 Once at the eye, pull the thread over itself, creating a looped connection. Thread a needle on the other end of the thread in the same fashion.